AT THE END of any training run, I make it a habit to look at the numbers behind the performance and having a watch with heart-rate monitoring technology or something similar will break it all down for you. One of the things that always stands out is not the time per mile, nor the distance, but the calories burned during the run, mainly because it always comes as a surprise to learn I’ve burned off 900 calories and that I now need to find ways to regain them. I don’t know about anyone else but in my experience, the last thing I want to do after a 15/20 kilometre training run is come in and have to dig into a large meal directly afterwards. Your stomach can feel a little bit unsettled after an hour and a half of running and oftentimes my appetite just isn’t there, despite my body telling me I need to refuel in the hours afterwards. This is one of the most challenging aspects of marathon training for me, as I am someone who must ensure that I am constantly fuelling up sufficiently for the number of miles I’m doing every week. 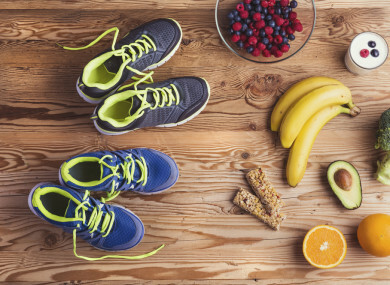 With this in mind, and with the Dublin Marathon just weeks away, Leinster Rugby and Dublin GAA nutritionist Daniel Davey has outlined three key points to consider for the preparation stage. If you haven’t already done so, I’d recommend checking out his Food Flicker website, which has a variety of recipe ideas and can be used in the lead-in period to this year’s marathon. “The 48-hour period before you take to the start line is that critical window when it comes to fuelling sufficiently for any race or high-endurance sport. “The general consensus is that the meal directly before the race — in this case, breakfast — is the most important one but in fact it’s only a top up as you should be storing the necessary energy sources — carbs and fats — in your body in the days before that. “If you’re going down the route of running on fat and low carb diets, you have to practise and train on that for months, so most of us, we look to nail our pre-race diets in the 24 hours before the marathon with a high intake of carbohydrate. “The vast majority will look to carb drive before a high-intensity race but if you can do this in the days leading up to it, you will be better served as the fuel will be stored in our body as a source of energy and you then don’t feel sluggish or bloated on race day having consumed a huge bowl of pasta the night before. “So, on the morning of the race, you can concentrate on topping up your carb intake through lighter foods and liquids, helping you to avoid that feeling of needing to go to the toilet. “My suggestion before the race would be to get up at 7am at the latest, and that allows you to fuel sufficiently but then digest and allow any pre-event anxiety to settle down with your breakfast. “Things like fruit, and particularly bananas, are smart options and while you might feel like boosting energy with a hearty bowl of porridge, most people find overnight oats or granola lighter and easier to manage. “I’d also recommend a portion of scrambled egg with four slices of sourdough toast to get a good intake of carbs, with fruit juices — particularly apple — an ideal choice to top up your carbs without feeling full, bloated and sluggish. “The key is to eat and consume enough to be fuelled without running the risk of getting stomach cramps or needing to go to the toilet, so the best piece of advice is to start the process 48 hours in advance and then you’re not forcing yourself to eat large amounts at the last minute. “As you negotiate your way around the 26.2 mile course, it is only natural for your fuel sources to reduce as the race progresses, no matter how much training you’ve done. “It is a good idea to leave sports drinks on your route during training runs so that you can take them on board in the build-up, thereby familiarising your stomach with these drinks while running as everyone can react differently. “Again, the same applies to the energy gels that are handed out because anyone who is serious about running will have nailed this down in their preparation period, and high-performance athletes can consume up to six during a marathon. “Many of you will be finalising your preparations over the coming weeks and while the weekends are the most popular time to get out for your long run, the reality is that you’ll have to fit in a few miles during the week. “This means coming in from work, putting on the runners and then hitting the pavements, and by the time you get in and shower, it can be quite late before you’re in the kitchen and thinking about refuelling. “If you find it difficult to consume food directly after your run, the best option here is to take on a liquid recovery drink. “Some sort of recovery shake, smoothie or even flavoured milk is a great place to start as it is easier on the stomach and with help with that initial phase of recovery. “A little later, you can then look at the second phase of recovery which could include something as simple as a baked potato with chicken or tuna, a small pasta and chicken dish or even a shepherd’s pie. “Don’t worry if you can’t eat a large meal but do aim to eat something that provides some protein and carbohydrate. You can make up the deficit the next day but that two-three hour recovery period is something you should focus on initially. “Preparation and practise is key because you find out what your lower and upper limits are and I’d recommend practising your race day routine around food and drink at least four times in advance of the marathon. “You should break down your prep into different phases, and look at a number of meals that you know work well and create a timeline of the days before the race. “As mentioned above, that 48-hour period is crucial and knowing what your meals and food intake will look like before, during and after the race will give you great confidence. “Practising this over and over, and knowing that it works perfectly for you, eradicates the possibility of something going wrong on the day and it’s a very powerful tool in building confidence. “You’ve done the work both in the kitchen and in training, so you’ll go into the marathon in the knowledge you’ve done it before and it works for you. That in itself is a great source of confidence. “Finally, you should have ticked everything off your performance checklist in the days and week leading up to the race. Email “Fuelling for a marathon: 'Nailing your preparation is powerful for confidence'”. Feedback on “Fuelling for a marathon: 'Nailing your preparation is powerful for confidence'”.